A warranty deed can be used in Missouri to convey title to real property. Missouri does not offer a statutory form for a warranty deed. In a duly executed warranty deed, the following covenants are generally included: covenant of seisin, power to sell, freedom from encumbrances, quiet enjoyment, and warranty of title. A warranty deed in Missouri will pass the after-acquired title of the grantor and will be effective as if the legal estate had been in the grantor's possession at the time of conveyance (442.430). The grantor in a warranty deed warrants the title against the acts of all others. 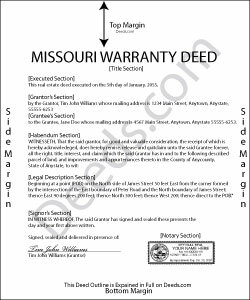 A warranty deed needs to be signed by the party granting the conveyance and should be acknowledged or proved and certified in the manner prescribed by Missouri Statutes. However, all parties are required to sign if the deed is being recorded in the City of St. Louis. For warranty deeds acknowledged or proved within Missouri, the proof or acknowledgement can be taken before a court having seal or a judge, justice or clerk of such court, or by a notary public. If the acknowledgment or proof of a warranty deed is taken outside of Missouri but within the United States, it can be done before any of the officers listed in 442.150 of the Missouri Statutes (442.150). The officer taking acknowledgements should have a certificate of acknowledgment or proof endorsed on the deed (442.180). Every warranty deed that conveys real estate that has been proved or acknowledged and certified in the manner provided should be recorded in the office of the county recorder in the county where the real estate is located (442.380). Once a warranty deed has been filed for record, it will serve as notice to all persons of the contents thereof, and all subsequent purchasers and mortgagees are deemed, in law and equity, to purchase with notice (442.390).